ORIGIN was on the table tonight while we also bring back an old fave AGE OF EMPIRES III to test out the BUILDER expansion. Gamers: Enson, Allen, Wolfx, Heng, Boon Khim, Ivan, CK Au, Waiyan. Games: Origin, Age of Empires III with Builder expansion. ORIGIN was one of the more abstract looking of the Essen 2013 batch of new games. But it’s not as abstract as say Blokus though it also does not flow with any theme. It does look pretty and from all the plays we’ve had so far, everyone enjoyed the game including those from the BGC Retreat. Before going to Essen last October, we were given the heads-up by one of our gamer fren Rob Street who happened to have playtested this game (and also Expedition Northwest) with the Matagot crew that this would be a game we’ll enjoyed. 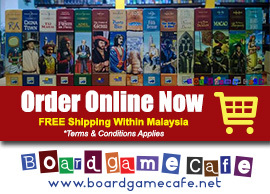 Therefore we’ve brought in an early batch of ORIGIN (and other Matagot games) direct from Essen for local preorders. The wooden pawns represent mankind as evolving tribes… the height of the pawns denote speed so the taller the tribe is, the faster it can move. It’s girth indicates strength therefore the large the piece is, the stronger is the tribe. While the differences in color denotes the evolution of races. The game play is simple. In your turn, you simply do either one of this action – Evolve, Migrate or Swap. To Evolve means to add a new tribe (with your own village marking ie a round marker in your player color to indicate this tribe belongs to you) next to another tribe. The only rule is that your new tribe must have “evolved” from the adjacent tribe with two out of three matching characteristics – speed (height), strength or color. Your tribe must also evolved upwards ie. if evolving from strength (or speed) the new tribe must be stronger than the adjacent tribe. For eg above, the white tribe (in the right-side) can evolved from the brown tribe (in the middle of the three tribes shown above) as it shared the same speed (height) & strength as the brown tribe except it has evolved into a white tribe. Migration is simply moving your tribe from one location to another, the number of space it can move is determined by it’s speed (ie height. You can only migrate to an empty land. Swapping is similar to Migration except you exchange places with the tribe in the destination space. In swapping, your tribe needs to be stronger (ie larger girth) than the tribe you are swapping with. The range your tribe can move is still determined by it’s speed (height). As your tribes evolve/migrate/swap, depending on which (color) destination space your tribe lands in, you get to claim some rewards. Landing in a Yellow territory allows you claim the (yellow) Action cards while Orange territory gets you the Permanent cards and Purple territory the Objective cards. 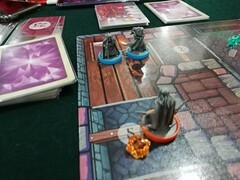 Action cards are useful for one-time use while Permanent cards remain on the table once played and it’s effect remains permanently throughout the game. Purple Objective cards are simply bonus VP for meeting certain objectives as specified by the card. You are however limited to just two Purple Objective cards but you can draw another whenever you claim one of your Objective cards. An eg of a Purple Objective claimed (below)… when the owner has 3 tribe pawns in North America, he can open this objective card to claim it and would get 6 VP at game end. He then redraws another objective into his hand. For Green territory, you do not get to draw any of the above cards (Action/Permanent/Objective) as your rewards. Instead you lay first-claim to the green hunting tokens, which basically is VP at game end. The hunting token is claimed by the first tribe to arrive in the green territory so it’s first dibs basis. The smaller squarish blue tokens are the connection rewards when you have tribe pawns that bridge/connect villages on both sides of a strait. Again these tokens are on first dibs basis. Example of Orange Permanent cards… the permanent cards grant its owner additional abilities in-game. However they’ve a pre-requisite to be met before you can play them… ie you need to have acquire the right level of spears (innovation tiles) before you can play the card. Innovation tiles can be claimed as part of your alternative reward for landing in yellow/orange/purple territories (in addition to its respective reward cards). ORIGIN is a pretty fast (and somewhat abstract) game of tribal evolution and expansion where your end objective is to claim the appropriate reward cards and bonus tokens to score the highest VP at game end. Rob, if you are reading this yes this game is great! AGE OF EMPIRES III (AOE3) has always been one of OTK’s favorite worker placement & area control game. This game is now reimplemented as Glenn Drover’s Empires: The Age of Discovery (why does boardgame need such confusing naming?) when they decided not to pay the upkeep for the rather expensive video game franchise name. 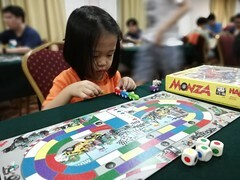 The game has lots of miniature figures, a beautiful game board and an engaging game play. When news that the much anticipated BUILDER expansion was announced in 2011, everyone waited… and boy, did they wait. We managed to get the BUILDER expansion in earlier this year but the deluge of new games especially the Essen crops meant we’d to wait further before we can get this expansion and the much-enjoyed base game back to our OTK tables. Above: All rise, the new Builders of the Age of Discovery! What does the Builder expansion provide? Why… Builder action figures obviously. Hehe. The Builder specialist provides a $5 discount when purchasing capital buildings. However if you send the Builder to a colony, each builder adds 2-4 VP for majority scoring – and not necessarily to it’s owner but the builder bonus VP is gven to the player who has majority (and secondary) control of the region. Encourages interesting conflict in regions containing builders! Eagle Games are also thoughtful enough to include the 6th player expansion (in orange color) with the Builder expansion so that you can now play AOE3 with 6 players! Here’s the Builder (second from left) shown with the action figures from the base game (from left): Colonist, Builder, Soldier, Missionary, Builder (again!) and Captain. Where’s the Merchant? The other notable addition from the BUILDER expansion are the new capital building tiles. 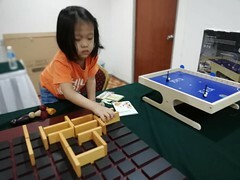 The base game suffers from a potential “capital building syndrome” where one or two particular capital building – if players are new to the game and not prepared for them – can somewhat break the game. I personally am not convinced. I do agree they are “overly strong” capital buildings but not necessarily able to break the game (ie the player who bought them has a certain advantage but not overwhelming). Anyway the BUILDER expansion replaces the capital buildings in the base game (the bottom row) with it’s own set of capital buildings (top row). You can see there are more capital buildings from the BUILDER expansion than there were in the base game. Above: Trade ships ready to sail…. The BUILDER expansion also introduces the concept of National Advantage. 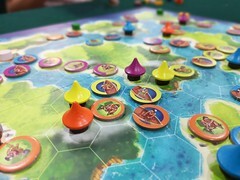 With each color being associated with a country – Orange with Holland – the player gets two country-specific National Advantage tile at the start of the game and choose one. This tile would then provide him with custom abilities for the game (very similar to the TRIBES ability in TZOLK’IN). In my game, I took Orange/Holland and is able to decide if I wish to go for an exploration strategy (captain) or take the money path (merchant). Money talks… so Merchant it was for Holland. The first aspect of AOE3 is the role selection / worker placement where each player gets five colonists (and some specialists) each round and decides where to send them – to one of the worker placement slot (above) to perform an action such as get trade good, build capital buildings, send to the colonies (for area control). The 2nd aspect of AOE3 is the jockeying of control in each of the colonies as there’s massive points to be gained by those who control the colonies (or at least be in 2nd). You send people to the colonies by commiting them to the Colonist Dock (the action space in the middle of the picture above with the replica merchant ship). 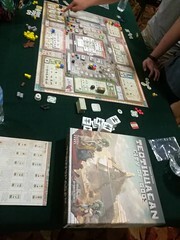 Some specialists like Missionary and Merchant are useful for Colonist Dock action as they provide additional colonist or money respectively when they arrived at a colony. 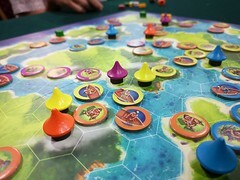 At the start of the game, only the Caribbean is open for colonization – the other regions had yet to be discovered. Each colony has a free trade good, given to the first player who commits three colonists to discover that region. But the regions would get crowded very soon when the colonies are discovered one by one… and players start sending their own folks over in an attempt to control the colonies. When determining who controls the colony – and hence gain the VP – two’s company but three’s a crowd! The game is played over 3 Ages (of 8 rounds in total) and colony majority scoring (6 VP for the 1st and 2 VP for the 2nd majority) is done at the end of each Age (so having area control can yield you substantial amount of VP over the 3 ages). The Capital Buildings (above) will cost you money but they can add special abilities to help in your quest to dominate the colonies. Some of the capital buildings provide a one-off benefit and a few of them seems to have questionable ROI on the cost of the building (which increases from one Age to the next) vs the benefits you gained from it. Orange has capital buildings that provided an additional Missionary and Merchant each round. Note: I didn’t manage to get any picture of the Soldier specialist. He has an important role to play in colonization. When sent to a colony, he can help his owner perform “population control” on the colony – by declaring war and shooting the opponent’s colonists! What did we think of the BUILDER expansion? 1. The Builder specialist figure and the discount it provides on capital building. Much needed as the capital buildings are rather expensive in Age 3. The Builder also provides an interesting decision when a player decides to send him to a colony. The presence of a builder in a colony adds 4 VP (or 2 VP for the second majority) to the area control majority player regardless of who owns the builder(s). But it’s a bonus of 4 VP per builders and it’s over and top of the 6 VP gained for having majority control of the colony! Imagine a colony with 3 builders (not necessarily all from the same player), the player having majority control of this colony would get (3×4)+6 == 18 pts! That’s a massive point swing equivalent to majority control of 3 separate colonies (6 VP each)! In the base game, when an enemy soldier is present in the colony where war breaks out, it’s a given decision to shoot down the enemy solider (so that he does not continue firing at your people with every war declaration). However with the Builder expansion, you may want to re-think whether your solider fires on the opponent’s soldier or choose to take out a Builder specialist (to deny the 4 bonus VP if you know you are not going to get majority control of that colony). 2. The National Advantage looks interesting – and given Tzolk’in has implemented that well in Tribes & Prophecies expansion – we see no wrong in that. The only question we still have is how balanced are the various National Advantages. Holland (ie my country for this session) appears to have two good National Advantage tiles – additional Captain or Merchant – but I’ve not looked at the other countries National Advantage tiles to see if they are as balanced as Holland’s. 3. New Capital Buildings. One concern – or perhaps just a difference in perspective – between the Builder’s set of Capital Buildings and the base game’s set is the new Builder’s set has more Capital Building tiles than the base. With the base game, almost all the capital buildings would eventually be made available for purchase (since there appeared to be just enough to last through the 8 rounds). This does provide the players with some “predictability” in trying to form a longer term strategy around the capital buildings they can target to purchase. However with the Builder expansion with more capital building tiles available but still the same 8 rounds, it means NOT all the capital buildings can be depended to be made available. As such forming similar longer term strategy on the expectation of some capital buildings being made available for play can be dicey. May not be a bad thing. Just a different perspective from how the base game was. 4. Broken new Capital Buildings? At first we thought so too . It did appear so with the Overpopulation (above) and Papal Edict capital buildings which allow its owner to “add three colonists to the colonies each round” or “add two colonists each round and also allow one other player to add two colonists” respectively. That’s a lot of people going to crowd the colony scene ie 7 new colonists arriving out-of-turn each round! But on checking the FAQ, it seemed we played this wrong. These two capital buildings are for one-time use so it’s only 3 + 2 + 2 colonists arriving at the turn the capital building was bought – and not 7 colonists each round. IMO with the FAQ, the capital buildings no longer appear overpowering. So is the BUILDER expansion a necessary buy for AOE3 owners? If you enjoy the base game, then yes I would recommend this as a buy for you since the Builder action figures, getting the extra 6th player expansion plus the new Capital Buildings do help to refresh the game. You do not have to incoporate all the components of the expansion into the game… you can always pick-n-choose which component to add. We did have MADEIRA all set up and ready to go… but since it was already late when we finished our Age of Empires III session, we decided to KIV the Madeira session until next week. But stay tuned for the first play of MADEIRA in M’sia!